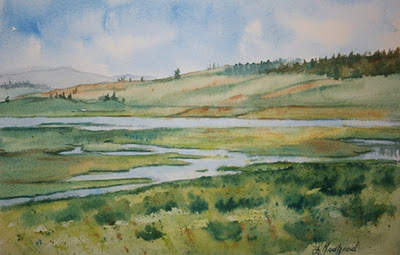 Today was the last day for my Watercolor Landscape class at the Kerrisdale Centre. For our last painting, I had them do a scene similar to the above image. 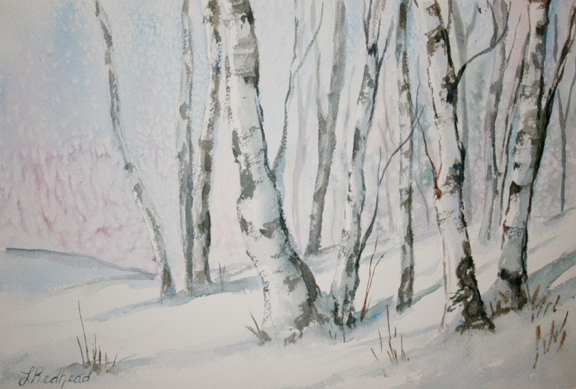 It was a simple painting of birch trees in winter. I really enjoyed everyone in the class. They were a mix of all levels but were very supportive of each other. I look forward to seeing many of them again in the New Year. I will be teaching at the Kerrisdale Centre again in January. The course is Fun With Watercolours. It is some basic (and eventually not so basic) exercises in negative painting. I will also be teaching a similar course to children (11+years). More information on that course can be found by clicking here. To purchase this painting, please visit my Etsy shop. Please use coupon code CHRISTMAS2011 to receive the discount. Prints also available through Fine Art America by clicking here. Eventide was an enjoyable painting to paint because it is from a photograph during my favorite time of year- the summer solstice. I painted it over a cold rainy couple of days and tried to recreate what summer feels like. I also wanted to capture the colors of the sunset over the water and the reflections of the boats. 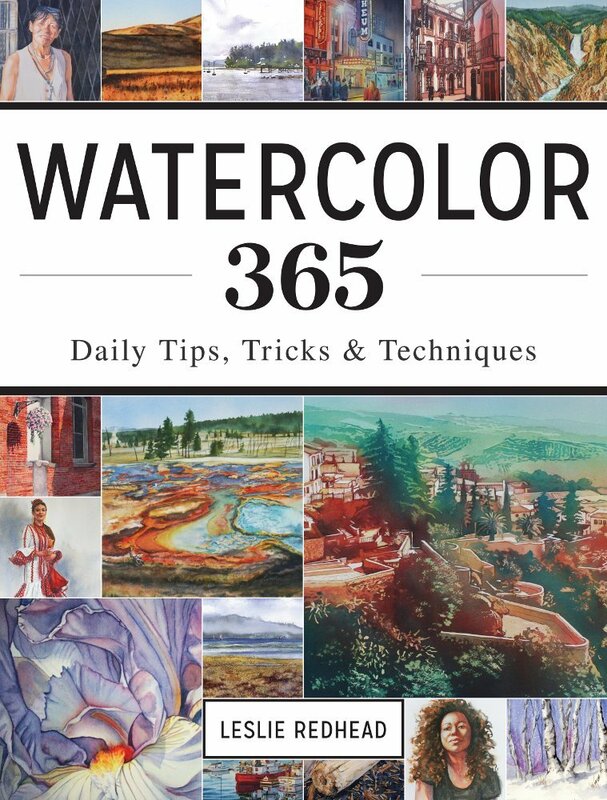 Today is World Watercolor Day! I am not sure the origin of World Watercolor Day but I am very happy it is in existence. I feel so blessed to be an artist doing what I love. 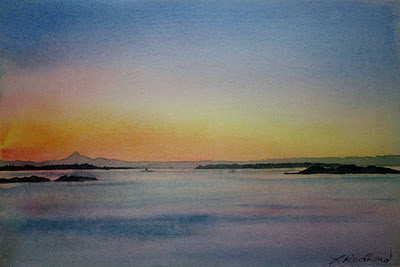 And what I love is watercolor! I spent my morning painting one of my favorite places - Yellowstone National Park. The above scene always takes my breath away and I could never tire of painting it. How did you spend the day celebrating this fantastic medium? 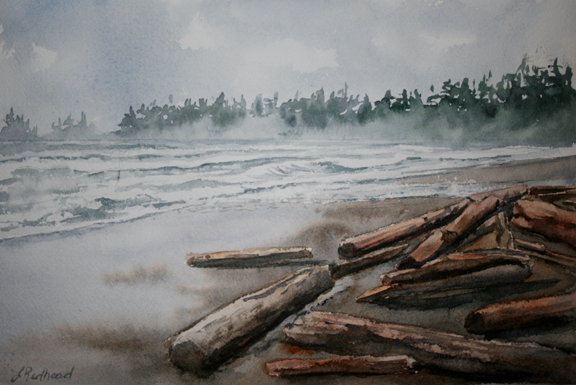 Tofino Driftwood is a painting done with my landscape class. Living on the west coast of Canada, the driftwood is a common scene and is part of many of my paintings. I am having a 20% off holiday sale on Etsy between now and December 5, 2011. Most of my paintings on Etsy are my small originals that I painted as demonstrations and studies for larger pieces. Shipping is also free to Canada and the U.S. If you would like to purchase a painting and do not live in Canada or the U.S., please email me or convo with me on Etsy (by hitting contact on the page) to discuss shipping. Or if you see a painting of mine that you would like but it is not on Etsy, just let me know by email that you are interested. Here is the most important part though! Be sure to use coupon code CHRISTMAS2011 at the checkout in order to get your 20% off. To get to my shop, please click here. 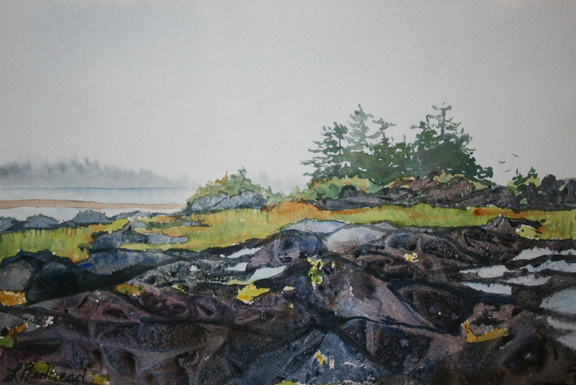 Rocky Coast is a painting of Frank's Island near Tofino, BC. Another one of my favorite spots. I did this painting for my landscape and west coast course. I feel like it is the perfect west coast scene. Original available through my Etsy shop by clicking here. Last night I did a demonstration for the North Shore Artists' Guild in West Vancouver. It was the largest group I have ever demonstrated for. I even had to wear a microphone headset thing and I was on the big screen. Or rather, my painting was. They seemed to be a great group of interested artists with a lot of support. Glad to see that. It was requested that I show how to do a pour. Always fun. Since each layer takes so long to do and dry and I only had an hour to do it in, I had 3 paintings prepared. The above painting I prepared for the last pour then I had the big reveal. Unfortuantely I didn't have time to finish it off with some minor adjustments last night so I did so this morning. I punch up a bit of color and clean up some lines. 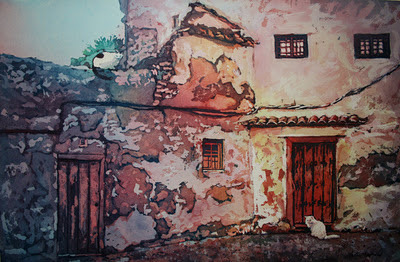 I will be doing a pouring workshop through the NSAG on January 28-29, 2012. On Monday, November 7 I am being interviewed on WizIQ by Dr. Nellie Deutsch. WizIQ is an online learning platform. The site is designed to provide online virtual classroom instruction. Dr. Nellie Deutsch holds a Doctor of Education (Ed.D) in educational leadership specializing in curriculum & instruction and is an E-Learning Professional Development Specialist. 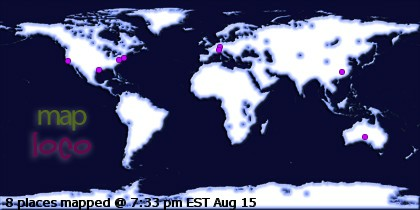 The interview is Monday at 3:00pm EST. To join in, please click here. It is an exciting prospect to be interviewed by WizIQ. This company is an online education system that is making learning accessible to anyone. I took a tour of the virtual classroom this past week and was impressed. I have been reading about how this is the way that education is going. I have set up a profile and am preparing to test drive a few courses. This courses will be free at first until I figure out how it all works. That means that not only will you be able to watch me demostrate (like the youtube videos of mine) but we can interact about the demo and about your own pieces. Pretty cool, eh? I am a little nervous about the interview. So if you get a chance, please join in and give me some support! It will be comforting to see some familiar names as part of the group. 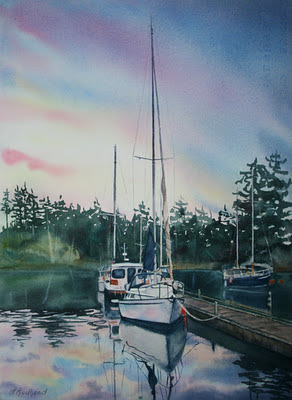 This past summer a kind friend loaned me the use of her home and studio while I was attending UVic. The home was located near Oak Bay Marina in Victoria overlooking the ocean and with a view of Mt. Baker. The sunrises there were so fantastic that I got up between 5:30-6 every morning just to take a photo of them. I probably have about 30 unique sunrises. Summer Sunrise was another demo for my landscape class. It is the first of many of my sunrises.